Last year (almost to the day) we went with our bird watching /photographers friends Candy and Andy to a spit of rock to get a look at the heron rookery at Manchester-by-the-Sea. The camera gear we took with us last year was adequate for the outing, but the D90 body/Sigma lens combo was pushing the limits of the TrekPod from a stability perspective. Since we knew we would not have to trek very far with a tripod, we took a beefier unit with us this time. In the year since we had been out there, we had acquired a slightly bigger Sigma lens. It seemed appropriate to bring it and see how it would perform under similar conditions. Bringing the bigger tripod was definitely the right decision. Even though the terrain was uneven, we were able to set up the rig and had confidence that it wouldn’t tip over. The older 80-400mm Sigma lens had built-in optical stablization (OS), but our newer 50-500mm lens did not. However, since Sigma recommends switching off the OS feature when the lens is mounted on a tripod, not having the OS capability did not hamper us in any way. In fact, when we sold the 80-400mm zoom to finance the purchase of the 50-500mm lens, we opted for the less expensive non-OS version. Why pay for a feature which we almost never use? We took a lot of different shots at various zooms (50mm, 500mm). The lens had no problem finding and locking focus, even with the haze. The action was smooth, fast, and almost silent…quite a difference compared to what we remember of the 80-400mm unit. Overall, the lens performed quite well during the shoot, although we wish we were faster on the trigger as this seagull was almost out of frame by the time we realized that it was on the move. On the tripod, the mouinted lens felt well-balanced and we had no problems maneuvering it while zooming. 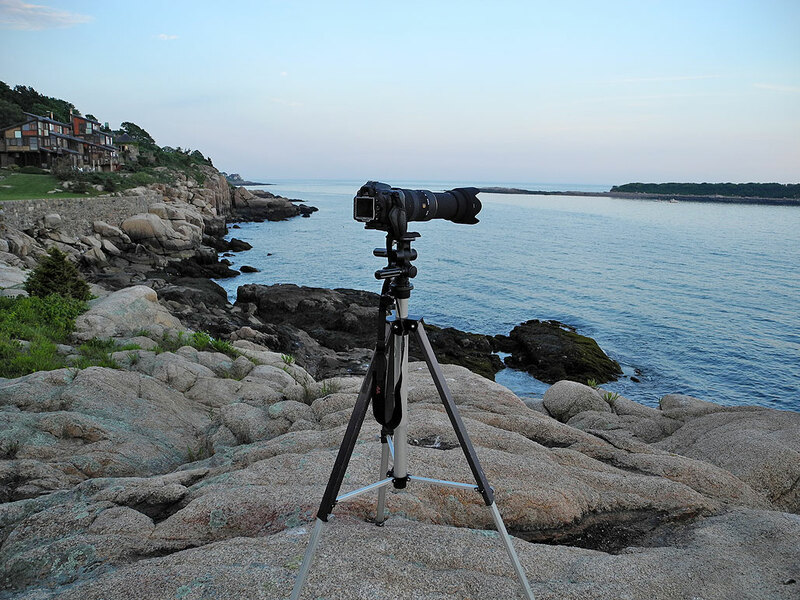 It was how we were able to track the seagull to the rock to shoot this next series (50mm, 250mm, 500mm). To give readers an idea of the quality of the image at 500mm, here is a crop of the image showing the seagull at actual pixel resolution. Without OS, we would not consider shooting without a tripod unless it was really really bright out. As the sun was starting to set behind the trees, we knew we didn’t have much usable light left. What else should we try? How about something that was a bit further away? How well would the resolution of the image hold together? Now seemed like a good time to find out. There was an island to the right of where we took the images of the sea gull. We knew we wouldn’t see much, but just what COULD we see? At 50mm, not much of what was on the island could be resolved. At 250mm, we could start making out some of the features on the outline. At 500mm, the shapes of the birds were clearly indentifiable. This last photo is actual pixels of a cropped segment of the image taken with the lens at 500mm (f13, 1/100). The birds were not as sharp as we would have liked. If we had taken the shot at 1/200, the outlines may have been slightly sharper. It was great to be able to come back to the same spot with some new gear to shoot the same scene as last year. However, we still didn’t get any decent images of the nesting herons and their young. It seems that if we really want to get shots of those birds, we will either have to get on a boat to get closer or come back with a 1000mm lens!